My new Nomad arrived last week, and I have been busy assembling and customizing and testing it since. I can safely say there is no bike on the planet that is better designed, assembled, or packed, and it arrived in absolutely *perfect* condition. Thorn did a magnificent job on it, and I am thrilled and completely delighted by their efforts. A lot of care went into it, and it truly shows. Though I have not yet taken it on a fully-loaded tour, it has performed brilliantly in my test runs, even fully-loaded over a lumpy, dried-plowed field several streets away. It has handled dirt, grass, rocks, very coarse poured gravel, and pavement with aplomb. I have every reason think it will be as brilliant on-tour as it is now. Unlike the "Danneaux's Sherpa" thread, which started with the bike a bit better than 99% "there", "Danneaux's Nomad" will be a journey to an end...showing the bike from beginning to full evolution. I hope you'll enjoy seeing the process as I make the bike truly my own and style and customize it to my needs -- and then use it. As you read and follow along, please remember our bicycles reflect our personal needs. What works for me might well not work for you, and my needs are somewhat specialized for extended, solo, self-supported journeys across desert regions where I must haul a lot of water and food through wilderness. My Nomad will probably look a bit "strange" compared to others, but it is the most beautiful thing in the world to me because it meets my requirements. Though "different" from others' Nomads in many ways, perhaps some of my kit will find application to your own needs. If so, great; I'd love to hear about it, as well as your thoughts and ideas. The Forum is a wonderful hive of collected wisdom and ideas, so if I miss something, I can count on you all to chime in, helpful as always. My thanks in advance! Let's plunge in, shall we? Andy Blance was ever so kind to work directly with me on every spec of the bike, and I truly appreciate his help in getting the correct size and in consulting with me on basic specs. Though we sometimes differed in our views, he worked as a colleague to find the best solution for me, with my needs and preferences respectfully in mind, and Robin reviewing the specs as well. I could not have asked for better. Andy strongly prefers straight or comfort handlebars, and has specified them now on each of his bicycles for very good reasons; they simply work best for him, and they provide a lot of leverage with a full touring load. With bar-ends, they very closely mimic the road cyclist's most common "on the hoods" riding position, and they simplify shifter options. One can even segue from "straight" (15°) handlebars to riser or "comfort" handlebars to accommodate changes with age and time. Straight 'bars allow use with a longer frame; in turn, that longer front-center aids stability. They're really a versatile option, and I can see why they have become so popular with the majority of cyclists. I, however, have found I must go with drops. Old injuries are quickly aggravated unless my palms face each other when riding, and straight 'bars with bar-ends just didn't quite work. I tried a neighbor's setup that was as close as possible to what I would need, and...no. Comfort aside, part of it is preference. I've ridden on- and off-road with drops exclusively for over 35 years, and they're familiar. I love riding on the hoods for most of the time where I can always cover the brake levers, and going to the drops for headwinds. There's 6 separate hand positions on drops, and I can fit interrupter levers for use on the tops when I really need to get my weight back over the saddle for steep descents on goat tracks and trails. I realize drop handlebars are a dying preference among trekkers and tourists worldwide, and I may face more limited options in future (i.e. 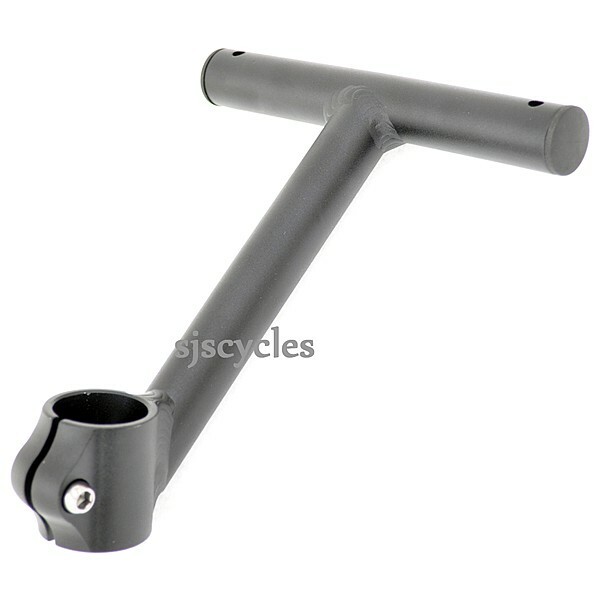 Tektro/Cane Creek are at present the only vendor of truly v-brake compatible levers), but they're great for now, and I do have the option of going to straight 'bars and bar-ends later, or even comfort 'bars, provided I fit a longer stem. So, even facing some compromises, it was drops for me. Deciding on the handlebars provided the foundation on which I could build. Once I went with drops, then I could choose a frame size. Standing at 5'11"/180cm with average proportions, there were two possible candidates -- a 565M and a 590M. Andy recommended the 590M, and I'm glad he did; it is a perfect fit. The 565M would have been a bit small for me and my intended use. By going with a "Medium" (M) frame, I picked up a bit more load capacity, thanks to the stiffness of shorter tubes. To make the 590M Nomad work with drops, I needed a much shorter than usual stem. The 560M Sherpa used a 110mm stem, but had a shorter top tube. An 80mm would have been "perfect" with the Nomad's longer top tube with the levers in the usual position, but Andy got me to nearly the same place with a 90mm stem by moving the levers higher on the handlebars, and I made up any difference by adding a 12mm spacer, which also moved the bars back a bit, thanks to the head angle. The levers are in the same position on the 'bars as the ones on my favorite randonneur bike -- which also uses an 80mm stem extension; ideal. The result is identical to my other road frames with similar length top tubes that are also fitted with 80mm stems. The tops of the handlebars are level with the saddle as is my preference, and reach is good. Check and done. = Ideal for stealth camping, as the bike shows up less. The rest of my camping-gear is inconspicuous, and it helps the bike is too. = Timeless and pretty well fashion-proof. It is a common color among work-bikes worldwide. = Lower theft potential locally, where eye-catching bikes are stolen in the wink of an eye. = Very easy to touch-up invisibly if needed, so the bike will remain fresh-looking and rust-free for decades to come. = 44cm drop handlebars, as noted above. = Plain (non-CSS) Rigida Andra rims for their proven wet-weather braking. I often have to make steep descents in the rain as I ride from the Valley over the mountain ranges that separate me from the High Desert, and I have been so very pleased with the braking provided by plain Andras and Kool-Stop Salmon-colored brake pads. I have found both pads and rims to last a very long time -- I still have a set of bonded, Mathauser-branded Kool-Stop salmons from the early 1980s with well over 28,000mi/45,000km on them that work great on the original rims. = As on Sherpa, a long-layback seatpost to get the proper saddle-BB relationship. = My preferred 170mm crankarms...in a Deore HollowTech II external-bearing crankset. I really like the stiffness and easy field-maintenance and bearing replacement of Shimano's HollowTech II crankset...even knowing its limitations. Shimano's basic design (cribbed from Roger Durham's original Bullseye tubular cr-mo design) is fine; what really kills it for long-distance use are the bearings. They are small in size, small in number, poorly sealed, and supported outside the BB shell in soft alu cups. Having surveyed the market and end-user reviews for a number of years, I believe the ultimate cure is a Phil Wood Outboard-Bearing Bottom Bracket. I snagged one on sale at a 36% off, put it away, and will install it around the 1,200mi/1930km mark when HollowTechs start to show problems in severe use. The Phil unit uses plastic liners on the inner bearing races so if one does seize, it won't immediately scar the spindle, unlike the majority of separate bearings that can be pressed into the original Shimano cups. The Phil cups are heavy, being milled from a billet of stainless steel, and the bearings are of very high quality, shielded nicely, and packed with my preferred Phil waterproof grease...the only grease I found to withstand the corrosive effects of Mt. St. Helens' volcanic ash. The Phil seems to hold up a bit better in long-term use than the Chris King injectable unit, so Phil it is. Time will tell. = After a lot of thought, I went with Andy's common recommendation of 40x17 gearing. This provides the lowest "Rohloff-approved" combination with a physically larger chainring and cog. This is not the even-even combo endorsed by Sheldon Brown, nor is it the odd-odd combo increasingly endorsed by high-end makers such as Idworx, but it should get the job done and wear well. Yes, it limits my use of a chaincase such as the Hebie Chainglider, but if worse comes to worst, either the chainring or cog can be changed. = I chose a Thorn pie-plate/bash-guard style chainring protector instead of a Chainglider out of concern for the effects of alkali dust in the desert. It is corrosive, talc-fine, and gets in everywhere. This guard is open, the chain can be cleaned and re-oiled, and my leg is protected from grease that would soon soil my sleeping bag and the 'ring is shielded from the far more remote possibility of a rock-strike. = I decided to go with the black-anodized Rohloff hub to deter corrosion in the alkali dust I frequent, and spec'd the disc option to future-proof the hub. The frame already has a disc-mounting tab, so this seemed a good time to specify a hub to match, keeping my options open. = I chose the standard Deore M590 v-brakes as simple and reliable for my needs. I have seen some examples of higher models develop play in their parallelogram linkage that led to squeal, and the basic model serves my needs well with powerful, reliable braking so long as I use the Kool-Stop Salmon/plain alu rim combo. = I spec'd the new SON28 dynohub with the "ball-shape" for my power-generating needs. Compared to the Klassik, it does seem to have less drag, and power output is the same or very nearly so, unlike the similar-looking but lower-output Deluxe model. The newer hub is a bit lighter, and the smaller shell has less volume to be affected by changes in temperature. Again, I chose black-anodized to resist the corrosive effects of alkali playa dust in the desert. = I went with the same Brooks B.17 saddle that I used on Sherpa. It is comfortable, proven in my use, and my favorite touring saddle. Black, of course. = I love SKS P55 mudguards (known to me as "fenders") because they catch so much of what would otherwise be flung by the tires onto me, the bike, components, and gear. Because of them, everything lasts longer and looks nicer. Like helmets, these are a personal choice and preference, but fit my requirements well. The can be removed and carried when I unexpectedly encounter wet playa that would soon pack the wheels to stoppage if they remained in place. I chose the P55 model to nicely cover my 26x2.0 Schwalbe Dureme tires, a model I have found to be a true all-rounder for my on- and off-road use. = The Rohloff shifter presented a special problem with drop handlebars, and I ended up choosing the traditional Rohloff shifter, mounted on a T-bar. The execution, however, is very different from what is generally seen. I owe my friend Andre Jute a nod here, as he reviewed my original placement and said, "You've got it all wrong, Dan" -- and he was absolutely correct! The new placement is perfect for my needs, and I'll address it in detail later. I think the execution cost me a few gray cells, but it was well worth the effort. I have another idea for placement that might work even better for others, yet remain as simple, reliable, and accessible. I decided against the Gilles Berthoud shifter after considerable research into how I turn doorknobs (yes, really! ), and reports by Dutch friends in the industry. I am not casting aspersions against Berthoud's shifter, it is simply another case of choosing the product best-suited to my special requirements. So, here you have it -- Installment One, The Arrival. Looking beautiful, Dan! Thanks for sharing! That's a plenty good ride for me at this point. But my Nomad MkII remains just totally comfortable. I hope yours enables you to pursue all your adventures & gives you solid support the whole way! Thanks, Jim! I appreciate your feedback, especially since your own Nomad looks so nice! Big Changes in your family, and it will take some adjustment, I'm sure. Still, it appears you'll be getting a pretty nice bike ride out of any visits -- right at a Metric Century! A good future training run, I think, and maybe a way to pick up a riding partner (your sweetheart's son) for at least half the ride, if you each return home alone. I have solved my pump-fitting problem. I had thought I might need to find a mini-pump, since there was really no place on the Nomad's frame to fit my Zefal HPX2; The Nomad has a shorter seat tube due to the greater slope of the top tube. So...I put a little more thought into it. Unlike the Sherpa's fastback seatstays, the Nomad has its stays more widely spaced, and the pump could fit between. Of course, there was the problem of how best to secure it, and that's where Zefal came to the rescue once again with a Doohicki Plus for the bottom, and a zytel nylon worm-drive peg at the top, attached to the seatpost. It works a treat, and the pump is so secure I cannot imagine a situation where it could possibly hop out (the little "wings" on the head end are securely held in the Doohicki Plus' slots). The pump fully clears the frame and can be easily extracted from above or from below. Best of all, I get to use the pump I already had -- a nice, longish frame pump that is reliable and does the job quickly. Next on my list of customizations was to find the Rohloff shifter placement "perfect" for my needs. I agonized about Rohloff shifter location as I talked with Andy about my Nomad. I finally decided a little empirical analysis was in order, and spent a good 40 minutes studying how I open doorknobs. Yes! The neighbors already think I'm nuts, so I had nothing to lose as I reached for various doorknobs and watched very carefully how my hand approached them, how I grasped them, and how I turned them...with doorknob as proxy for Rohloff shifter. As it happens, I very rarely approach a knob in a linear grasp, parallel to the door. Instead, I most often grab it end-on and wrap my fingers around it, turning with pressure from my thumb and first two fingers. After I had a good grasp (sorry) of the situation, I figured I could finalize my shifter choice with Andy. I went for the original Rohloff shifter due to its proven reliability, good weather sealing, ready parts availability, and the rubber cover had the extra bonus of isolating my hand from extreme heat or cold -- Ideal! I started out with the Rohloff shifter mounted on a 55mm T-bar just above the 105mm T-bar atop the headset. The idea was to get the weight of a handlebar bag as low as possible, yet make the shifter easy to reach. It worked...fine! No problems reaching it, and about the same reach as to a bar-end shifter. It was handy and convenient. Life was good. The trouble is, I also needed to mount my accessories to the handlebars and stem...and the 90mm stem was not long enough to accept the GPS in the same central location it enjoyed on Sherpa's 110mm stem. And, I needed a place for my Rowi camera clamp so I would have the ideal site for my GoPro video camera, preferably in a place where I could also turn it around to do narrations and "self-interviews". ...You have the Rohloff control on the wrong T-bar. You ride 95% of the time with your hands on the hoods, right? So the gear control should be next to one of your hands so you don't need to disturb your back every time you change gears. I hope those cables haven't been cut too short to try the control higher up. Annnnnd...Andre was absolutely right! Making it "happen" took some real thought and depended on Andy's foresight to leave the cable just long enough to reach and not be stretched unduly when the front wheel is turned. As it happened, the head tube angle of the Nomad, combined with the spacers on the steerer, allowed the 105mm T-bar atop the stem to place the Rohloff shifter exactly vertical over my handlebar so I won't ever crack a knee on it. There's plenty of room to reach all 'round the shifter to turn it without pinching my fingers against the handlebar. It works great; thanks, Andre for your suggestion! I believe the 55mm T-bar would have also worked to mount the Rohloff shifter in this location, but would not have left enough room for the GPS. I then removed the extra 105mm T-bar and replaced it with the 55mm to hold the handlebar bag just above the headset atop a slim spacer, gaining 50mm of rearward movement and placing the HB bag closer to the steering axis for greater stability. I may need to revert to the other 105mm T-bar for this application once I install my interrupter levers (if the bag rides close enough to rub my fingers). For now, it is perfect. The bike computer and bell/compass would still be visible on the 105mm T-bar, but ahead of the handlebars instead of behind. Lots of angles and sight-lines to keep in mind! I now have room to attach steerer-mounted bottle cages as before on Sherpa, and the sightlines are right to easily see my bike computer on the left side of the 55mm T-bar and the compass on my bell on the right side (I asked Andy to leave both sides on the 55mm T-bar, rather than cutting the "off" side -- I needed both for mounting accessories). The result exceeds all my expectations, and is so very easy to use. Nothing interferes with my shifting, and the cables have a nice, clear run to the guides. Nothing is strained when I turn the handlebars lock-to-lock, and I've got a place for everything and everything in its place. The only downside is a rather strange appearance, but the camera mount works perfectly, and I recorded my first "self-interview" as I rode along the other day, then turned the camera forward and to the side, catching all the angles I wanted. The camera mount (when used with a Click-Stand) also serves as a "tripod" for filming Camp Life at the end of the day. Yay! Another step toward making the Nomad meet my personal needs, and in doing so, several problems solved at once. In this case, the Rohloff shifter would end up slightly ahead of the handlebars, perhaps just to the inside of the brake hood, depending on stem reach and height combined with spacer placement and head tube angle. http://www.thorncycles.co.uk/forums/index.php?topic=3896.msg17113#msg17113 I think I can refine and modularize the process this go-'round. Meanwhile, I figured I could mount my taillights to the Thorn EXP rear rack. After some careful measurement and the drilling of one 5.5mm hole, I was able to bolt my Portland Design Works (PDW) Radbot 1000 alongside my B&M Toplight Line Plus. The taillights both sit below the rack-top to avoid any interference with a load. As per my usual practice, both are refitted with stainless fasteners and vinyl thread caps, the last to prevent snagging a hand or strap when un/loading the bike in the dark while on-tour and to keep the threads clear of alkaline dust. While the placement is not individually symmetrical, the lot fits evenly within the outlines of the rack bracket and provides a really nice-eye-catching display to the rear. In heavy urban traffic, the Radbot 1000 can be set to solid, slow pulse, or stutter-blink, while the Toplight Line Plus provides a wide, steady reference that does not require batteries for sustained use in more rural areas. The blinky on left is consistent with practice on roads in countries where the drivers keep right. So, what bike would be complete without a Mudguard Mascot? When I was still attending uni, I came up with the idea that each of my bikes should have a mascot to symbolize some key characteristic. It was silly, but fun. At the time, Robert Schleich company of Germany marketed small rubber animal-shaped toys in large plastic "fishbowls". One reached in, churned around, and picked out the animal you wanted for the princely sum of USD25¢. My '89 Miyata 1000LT got a gray wooly mammoth to symbolize determination (and to match the "light metallic smoke" color). The 1970 Raliegh Gran Sports (white) got a billy goat for stubbornness. The blue 1983/84 blue Centurion rando bike received the blue bird of happiness. As rode along -- and depending on circumstances and the mood of the day (and exam results!) I either rode in pursuit of it or caught it outright. My other bikes have different mascots on their mudguards. I secured them each with a heated straight pin from below and a drop of beta-Cyanoacrylate from above. Remarkably, no one ever plucked one off while the bikes were parked. The rubber didn't always age well, but a coating of beta-Cyanoacrylate served as a reasonable embalming fluid for keeping them intact and free of any fatal cracks. A hard-plastic Playmobil raven was just the ticket to continue the tradition on the Thorn Raven Nomad Mk2, so off I went to eBay, PayPal account in hand, and waited the 10 days or so for delivery. The results were just what I wanted, after cutting off the bird's grasping feet (!). As before, the ornament is attached from below, this time using a small flat-headed nail through the mudguard's end-cap from below, and secured with Cyanoacrylate gel both above and below, including the nail head. The bird slips on and off the fender with the end-cap to which it is captive. A little out of sequence, but here's some "first ride" photos (attached, showing the original under-bar shifter setup). I have achieved my classic, preferred 45° back and arm position atop the brake hoods, and a great knee position. The standover clearance on the compact but correct-sized frame is ideal for my off-road use, when high-bright light often prevents me from seeing I'm stepping off the bike into a pothole...until I do. No problems here! I have also attached a profile photo showing my position on my favorite rando bike, Sherpa, and the new Nomad Mk2. For all practical purposes, I have the same position and fit on each. Like a dream. Actually, like a super-duty road-touring bike -- balanced, stable, carves nicely into corners, yet really heavy-load capable. It feels like a far lighter bike than it is, with light, agile steering and a nice "tossable" feel. Final expected weight all-up but dry and lacking a touring load should be in the neighborhood of 46lbs/20.8kg when complete and finished -- right in line with what I expected, and about 4lbs/1.8kg more than Sherpa, but with a different rear rack and some small detail changes. For me, the drop handlebars make for an easy comparison. My Burley Rock 'n' Roll tandem is also set up for road use with drops and road slicks, and weighs-in at the same 46lbs and I've done a number of 260km rides on it solo very happily, and expect to the same on the Nomad. Rohloff impressions (all favorable) will follow in a later post. By the way, the favorite green jersey commemorates the legendary Wicklow 200, thanks to a good Irish friend. I've been thinking about "Oikaze", a Japanese fishing term for "favorable following wind", according to a friend. Hmm. That sounds like a tailwind to me, and I wouldn't mind always riding one of those! Probably that wee bit better than Ravin' Raven" ...or... "The Batman Bike" as the neighbor kid calls it. I really like that solution, the Rohloff shifter on a T-bar *above* your drop bars. Yeah it looks funny, but the real fun of the Rohloff is the easy shifting, and you have it! "The Batman Bike" as the neighbor kid calls it. Holy T-bars Dan, you're well on your way now. very clever the way you mounted the rohloff shifter ,btw what do you think of the rohloff. yeah you done it again dan fair play to you, you have the patience of a saint when it comes to building bikes . So the Roh shifter is on the T bar? Can we see that in a close up please? And will you run with a bar bag? If so, where fitted. Happy to help. Remember when I identified as a key reason for recommending Thorn as the place for serious tourers to shop: "Thorn doesn't mind giving the customer the uncut steerer." Everyone chuckled and thought I was making a joke; I wasn't; it's a pressure point in assembling a touring bike (or a well-appointed utility bike) to fit and work just so. Love your photos, Dan: everything so carefully thought out on your bike, an example. That looks lovely Dan. Nice to hear you had such good service from Thorn. I'm happy with comfort bars and the shifter in the usual place, but I've seen a couple of Nomad's with drops, mounting the shifter on a T bar, usually below the bars though. When I got my Nomad the only thing I wasn't happy with was the lack of a proper pump mounting! I use a Topeak Morph (excellent) in the same position you have your Zefal but am not happy with the velcro mounting, still it's never fallen off!